TAG Heuer designed this cockpit of a watch in collaboration with Mercedes Benz. In the spirit of the famous Mercedes Benz SLR 722 supercar, the CAG7010.BA0254 Tag Heuer SLR Calbre S Laptimer for Mercedes Benz Men’s Watch is the epitome of performance and technology with its amazing electro-mechanical hybrid of watch-making expertise and quartz precision. Comprising 230 mechanical components and five bi-directional micro-engines, this weighty timepiece is the answer for the man with avant-garde tastes and high-tech gadget needs. 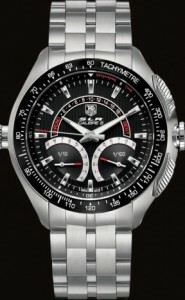 The CAG7010.BA0254 Tag Heuer SLR Calbre S Laptimer for Mercedes Benz Men’s Watch features a 47 millimeter satin finished stainless steel case with polished edges. The 5-link bracelet is also crafted from satin finished stainless steel with a folding clasp deployment buckle complete with SLR lettering and safety push buttons. The black dial highlights silver-toned hands and luminescent index hour markers for ease of readability in low light conditions and is protected with a scratch-resistant sapphire crystal with double-sided anti-reflective treatment. Time in hours, minutes, and seconds. Perpetual calendar that accurately calculates short and full months, including leap years, until 2099. Chronograph/stop-watch with precision of 1/100th of a second and two elapsed times. Regatta – 10-minute countdown (with indicators on the bezel). The stop-watch will automatically engage after the Regatta has completed the count-down. Laptimer function, up to 20 laps. The bezel displays a tachometric scale in silver print on a black PVD-coated surface that evokes the look of the SLR car. Both cutting-edge and ultimately glamorous, this timepiece is a showcase of topnotch quality and styling, much like the Mercedes Benz SLR it complements. Great article – thanks for including a list. I enjoyed how flawlessly you wove technical info through eloquent phrasing.